Clean bamboo flooring by wiping up spills immediately, sweeping daily and mopping regularly. Avoid pouring cleaning products directly on the flooring. Never apply wax to bamboo flooring. When liquids spill on the flooring, wipe them up immediately before they have a chance to soak into the bamboo. In areas where spills are more likely, such as in front of a sink or ice maker, place a small rug on the floor to help absorb any liquid spills. Use a broom or dust mop to remove dust or dirt from the floor every day. The grit of dust and dirt wears away the finish. Sweeping removes these materials and minimizes their effects on the bamboo finish. Place felt protectors on the bottom of furniture legs to prevent them from scratching the flooring. Be sure the broom has soft bristles to prevent damage when sweeping. Use a damp mop to clean the floors on a regular basis. Choose a cleaner approved for use on bamboo flooring. 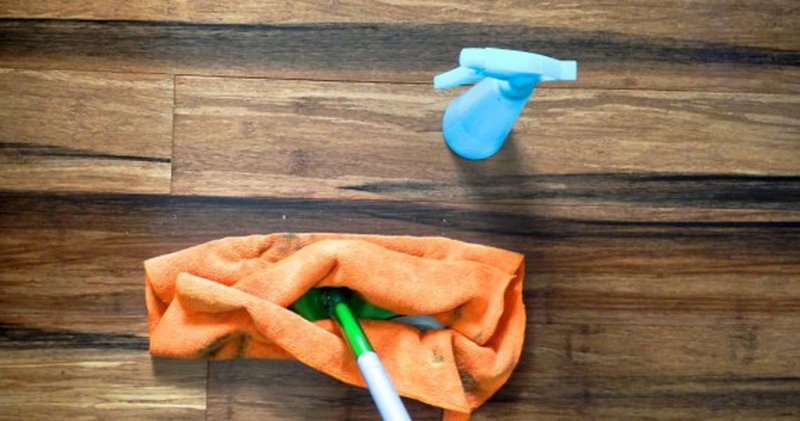 Apply the cleaning product to the mop and not the floor, as applying them directly to the floor may cause damage if they soak through the finish and damage the bamboo.